Trailer and poster added for upcoming movie “Linking Love” starring Yuka Tano and Anna Ishibashi. Movie is based on internet novel “Linking Love” by Hiroshi Hagishima and directed by Shusuke Kaneko. Setup for the film follows college student Miyu Mashio (Yuka Tano) as she travels back in time to when her parents were college students. She starts up an idol group there to get her father interested in her mother. “Linking Love” opens October 28, 2017 in Japan. Trailer and poster added for upcoming live-action film “Samurai Sensei” starring Hayato Ichihara. Movie is based on manga series “Samurai Sensei” by Esusuke Kuroe and follows 2015 TV Asahi drama series “Samurai Sensei” which stars Ryo Nishikido. “Samurai Sensei” opens November 18, 2017 in Japan. 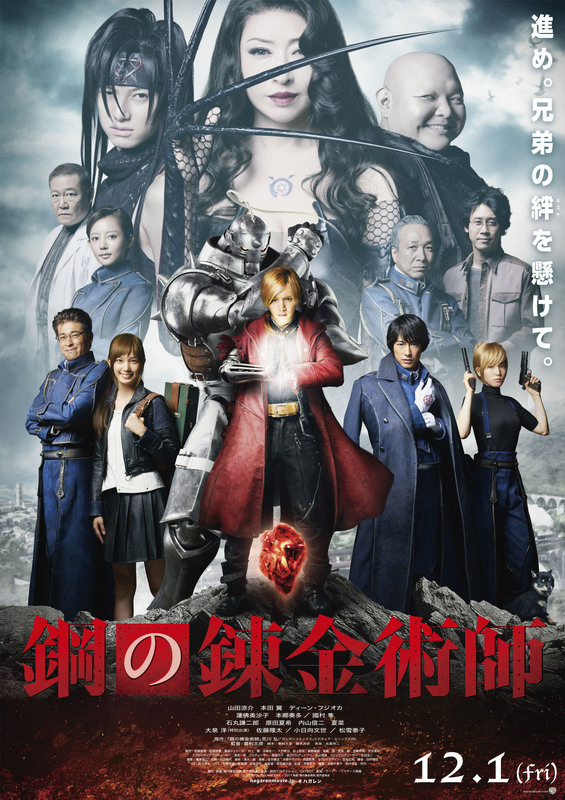 Poster added for upcoming live-action film “Fullmetal Alchemist” starring Ryosuke Yamada, Tsubasa Honda, Dean Fujioka and Yasuko Matsuyuki. Movie is based on manga “Hagane no Renkinjutsushi” by Hiromu Arakawa. “Fullmetal Alchemist” opens December 1, 2017 in Japan. Teaser trailer and poster for movie “When The Curtain of Prayer Descend” (literal title) starring Hiroshi Abe, Nanako Matsushima and Junpei Mizobata. 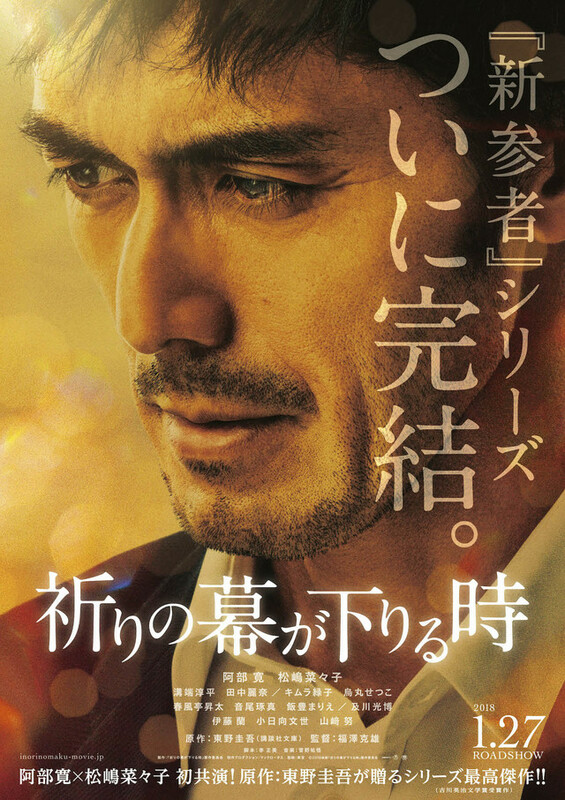 Movie is based on 2013 novel “Inori no Maku ga Oriru Toki” by Keigo Higashino and directed by Katsuo Fukuzawa. Several other novels by Keigo Higashino in the “Kyoichiro Kaga” mystery series has been adapted into films and drama series. Hiroshi Abe plays Detective Kyoichiro Kaga. “When The Curtain of Prayer Descend” will be released January 27, 2018 in Japan. “Pumpkin and Mayonnaise” will be released November 11, 2017 in Japan. Teaser trailer and poster added for upcoming movie “Uso wo Aisuru Onna” starring Masami Nagasawa and Issei Takahashi. Caption on the poster asks “Who are you?” Story for the film follows a woman (Masami Nagasawa) who learns that her boyfriend (Issei Takahashi) has created a web of lies about himself. Movie is written and directed by first time director Kazuhito Nakae. “Uso wo Aisuru Onna” is now set for release January 20, 2018 in Japan. 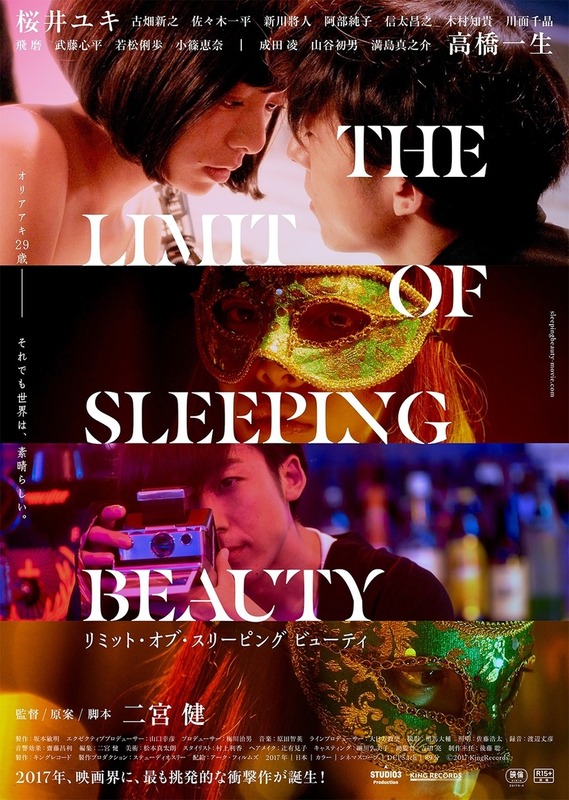 Teaser trailer and poster added for upcoming movie “The Limit of Sleeping Beauty” starring Yuki Sakurai and Issei Takahashi. Movie is written and directed by Ken Ninomiya. “The Limit of Sleeping Beauty” opens October 21, 2017 in Japan. 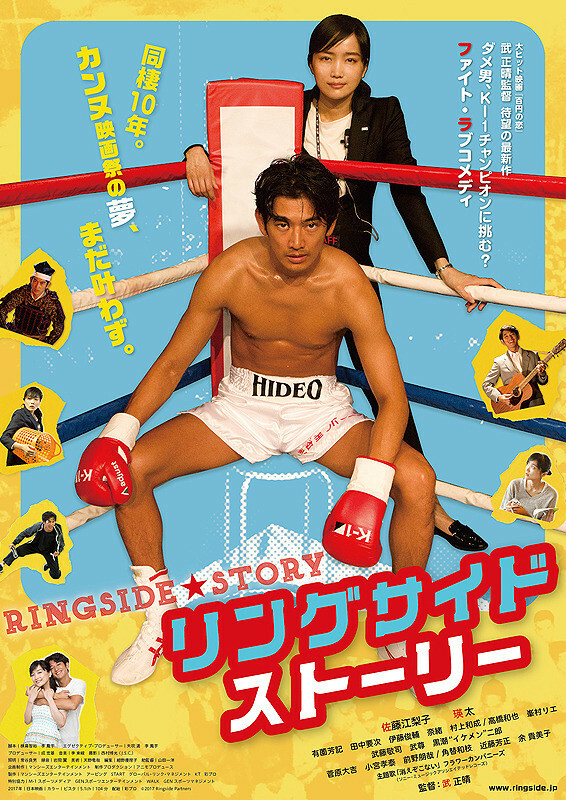 Trailer added for movie “Ringside Story” starring Eita and Eriko Sato. Movie is directed by Masaharu Take. Story for “Ringside Story” has Eita playing unpopular actor Hideo. When he misconstrues his girlfriends (Eriko Sato) enthusiasm for her new job at a professional wrestling league, he takes action. “Ringside Story” will be released October 14, 2017 in Japan. Trailer and poster added for upcoming based-on-a-true-story film “Death Row Family.” Movie stars Shotaro Mamiya, Katsuya Maiguma, Naomasa Musaka, Kanako Irie and Hazuki Shimizu as the family that goes on a crime and killing spree. Movie is directed by Yuki Kobayashi. “Death Row Family” opens November 18, 2017 in Japan. Teaser trailer added for movie “Kyonen no Fuyu, Kimi to Wakare” starring Takanori Iwata, Mizuki Yamamoto and Takumi Saito. 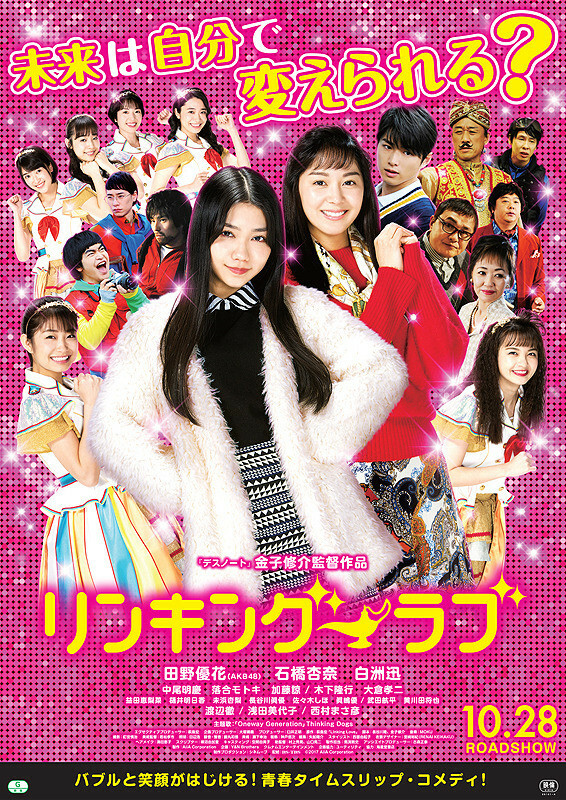 Movie is based on 2013 novel “Kyonen no Fuyu, Kimi to Wakare” by Fuminori Nakamura. Filming for the movie finished August 17, 2017 and the movie is now set for release March, 2018 in Japan.